Perjury delves into the stories that hide behind death, religion, and untruths. From conversations with the dying to bold claims and ownership of the “liar” that is an author, Lord covers all the bases in a raw, brutally honest fashion. For every lie holds greater truth. There are certain things a six year old should not be made aware of, demonic possession only being one of those things. I’m sure the list could go on and on, but this is first most in my mind, and should certainly be near the beginning of any such list. An exorcism at six is something akin to a christening at ninety. It’s all quite simply a waste of time at that point. But at six years old, suffering from what the adults in my life described as ruthless, violent nightmares, the head of our household deemed it was the only sensible option. My grandfather hadn’t always been a reverend. At least, as far as I know, he hadn’t. I know he held other jobs: teaching tennis and woodshop and trumpet, and rescuing for the ambulance on emergency car accident calls. He was even in the military at one point, the Navy, I believe. He never went overseas, but instead taught the young recruits swimming. Perhaps that is where it came from—his lifeguard tendencies. It seemed in his nature to be a teacher, a rescuer, and therefore, only a small leap to reverend. I’m sure the day I was born my grandfather was well on his way to rescuing me. My mother was laid up for twenty-six hours in labor. It wasn’t until that final hour when the doctors realized her entire pelvic area had filled itself in with extra bone. If a human body ever wanted to be sure the future generation could not come forth, this seemed the best failsafe method I’d ever heard of. However, she opted for a cesarean instead of death, and out I came, with the cord wrapped around my neck twice, purple, and silent. The doctor breathed life into me, and though I came out wearing my own gallows three hours before the mark of All Saints Day, my mother still wanted to hold me. My grandfather had left after about two hours into the entire process to return to his church, where I am told, he spent the evening on his knees at the altar praying for his daughter. I wonder now, if he thought to pray for me then? If perhaps he had done so, I would have been spared the frightening memories of my childhood, and the sermons of death and damnation would have pinged lightly off me, instead of burying deep in my gut. If he did pray for me, at all that night, then his faith was as steadfast as Gibraltar, and I would envy him that. I wish I were able to recall those nightmares, at least so I would be able to justify the actions of the adults around me. Even now, at my age, I am afraid that understanding doesn’t come easily for these sorts of things. I suppose they reacted in the way they felt was best, and so I’m left with vivid memories of my grandfather, dressed in his Sunday best. I remember the men with him, in their dark suits and faded neckties. I remember the small little white vial, with the gold cross painted on the side of it, and how my grandfather would tip it with his fingers over the top like I do now with a cotton ball and alcohol. I remember the flick of his fingers, as the water flew in beads around the room. The men went from corner to corner, snapping water from their fingers and praying in the deep monotones that are difficult to make out as actual words. I stood in the center of that room when my grandfather put his damp fingers on my forehead and made the sign of the cross. Suddenly, all of the men had their hands on me. Their thick fingers dug against my scalp, and hard-calloused hands covered my shoulders in entirety. My grandfather never moved, except to put his other hand against my back and hold me in place. I thought about running, or kicking them. Instead, I cried. I stood there and sobbed, and the louder I became, the louder their prayers. Soon enough, they deviated from the Lord’s Prayer and moved on with their own litanies. All of them, saying different words, until the prayers themselves seemed to roil around me. When I thought I could stand no more, that my grandfather, this man who took me out once a week for peach ice-cream on a sugar cone, was truly trying to kill me, he stopped. The men, my grandfather included, left the room. They made their way down the hall to the kitchen, where the adults all seemed to congregate anytime more than two of them were together. I’m sure there was food, as my grandmother was not the kind to have guests in the house with no refreshments, but I didn’t see a bite of it. I stood in my room, with the water beads glistening on the wall and a damp forehead, and wondered what I had done wrong. I was six years old. 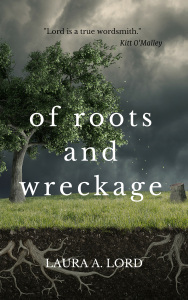 “With a cover that really pops and a title that stopped me in my tracks – I decided this book of poetry was worth clicking the “buy now” button. I was more than pleased with my purchase as the author presented beautifully crafted poetry but she also added something extra – stories. Stories from her past that led into the poetry. The stories are free of any sunshine and rainbows fluff- they are life stories, captured and shared. My description simply cannot sum up the overall experience of reading the stories and then delving into the poetry. It is pure magic though – a combination that I’ve not seen before and I definitely hope to see more of from this author. “This collection of poetry and vignettes feels intensely personal, while also being easily relatable. Lord writes with literary flare. Her words are sparse yet compelling, a story painted with a single stroke of the brush. Lord doesn’t shy away from the difficult topics. Here she tackles religion, love, and death. Her approach is sometimes straight forward and other times sneaks up on us from our blind side. Regardless of approach, her words always feel honest. 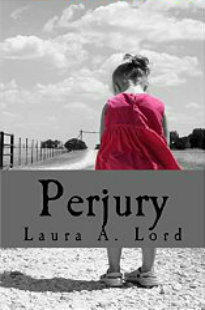 This is how you write a book of short stories and poetry: Perjury by Laura A Lord! “I opened Perjury expecting to find a collection of short stories and Poetry; instead I found a collection of a woman’s life. 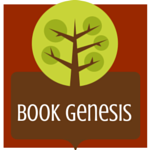 Themes of femininity, motherhood, and as the name suggests religion, grief and death flow on those pages with skillful words that make you think and get you to feel. With interesting plot twists that are both unexpected and memorable, Perjury reminds me of the novel Violin by Anne Rice. Laura A Lord defiantly has the literary writing skill of Rice.